From a German Roman Catholic paper: Religion had an unbelievable influence in my life. By Sabine Just. Star violinist André Rieu fills the biggest stadiums in the world. He started his musical career as a child in a church choir. In this interview the 66-year old speaks about childhood memories, music from the heart and his plans for Christmas. Beginning January 14th 2016 he will be touring through Germany. 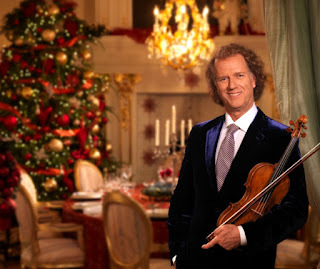 Mr. Rieu, soon it will be Christmas. How do you celebrate these holidays? I have been offered millions for giving a Christmas concert somewhere. But for Christmas, I am at home. My children will cook, that is a nice tradition. We will all be together with the children and four grandchildren. No one can tear me away from that! You love to play "Ave Maria" in your concert. Is this religious touch in your music important for you? Yes, I was brought up Roman Catholic. Here in Maastricht we are almost all Roman Catholic. And I can tell you that this religion has had an enormous influence on my life. From the age of 5 to 11 I sang in the church choir. I always tell the audience that if they like to give their children a musical education, the best is to send them to a church choir for their musical and social development. I have very fond memories of the time in the church choir. I remember one festive day that we had sung a long Mass by Haydn. The sun shone through the colorful stained glass windows, ten priests stood to the right side and ten to the left, and the church was filled with incense. This atmosphere impressed me so much that it will never leave my life. In the meantime I don't go to church so very often anymore, which I have to admit. But the Christian values that have shaped and characterize my life are still part of that today. What outside the Christian values is important to you? My family is most important in my life. I travel around the entire world and I can do that just because I have a family. I was born in Maastricht, I live in Maastricht and I will die here. I firmly believe that a permanent residence is a place to come home to and that is simply important. And of course the music. Music always plays an important role in my life. Music, I think, is the kind of art that touches most hearts. And I make music for others, with my heart. When I am asked where my success comes from, I usually answer: "It's the way how my orchestra and I make music together. We just don't play notes, we play with our hearts. I wanted people around me who just want to play together, and be friends; that is our secret. Although I am the boss, I and all the orchestra members are always there for each other at the same time." Nöel en famille à Maastricht est quelque chose de très important pour André, il y tient beaucoup et c'est normal qu'il ait besoin de se retrouver parmi les siens, lui qui est très souvent absent de chez lui pour ses concerts qui ravissent son nombreux public, tout autour du monde. Joyeux Nöel, cher Maestro et GOD BLESS YOU. Francine. André has told others he doesn't believe in God, but deep down he is a spiritual man; that comes across in his music. I think what he means is that he disagrees with some of the teachings of the church. At any rate, he seems more peaceful and centered as he gets older. I know we have heard it from Andre many times, but each time I read his thoughts and beliefs, it makes me realise all over again what an extraordinary, ordinary, man our beloved Maestro is. He offers us his heart over and over again, and we give him our heart right back. Andre is a true "human" human-being and we all love him for it. Thank you for posting this. Dear Sue and John - many thanks, once again, for all your hard work on our behalf. 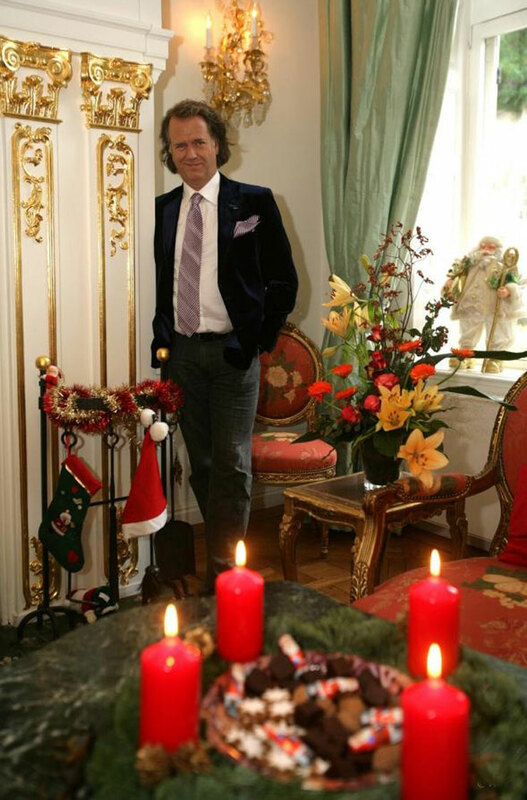 I wish you and your families a Very Joyous Christmas and all Best Wishes for a wonderful 2016.